Whoever did PR for Brussel Sprouts before 2010 was doing a really bad job. Children everywhere had nightmares about these poor guys– they were so misunderstood! Brussel sprout affectionados of the world are now in luck. The delicious little orbs have finally proven themselves and achieved rockstar status on the national cuisine landscape. Seriously though, along with lima beans they were probably one of the most controversial vegetables out there. Few sights could bring an intense wave of despair upon my childhood dinner table faster than Brussels sprouts. They were definitely a candidate for the napkin trick. Why? Because they didn’t pass the smell test–they kind of reek. I finally came to my senses, though and I’m now obsessed with the delicate little cousin of cabbage. My standard way of cooking these is pan searing them with a bit of olive oil, salt, pepper and maybe some lemon juice. For tonight’s dinner (grilled chicken– I’m not even going to bother writing a post on that one), I wanted a side a little less boring than my main. I had some Grey Poupon and heavy whipping cream in the fridge and voila. This recipe is dope. Halve sprouts lengthwise. In a large skillet heat oil and butter over moderate heat. Arrange sprouts cut sides down, in one layer. Season with salt and pepper, to taste. Cook sprouts, without flipping, until the sprouts are golden brown (approx 5 minutes). Add the shallot, wine and broth bring to a gentle boil. Once boiling, reduce the heat to medium-low , cover the pot with a lid and cook the sprouts until they are tender, about 15 to 20 minutes. Remove the lid, and scoop out brussels (leaving the sauce in pan). Add cream and simmer for three minutes, until slightly thickened. Stir in dijon. Season to taste with salt and pepper. 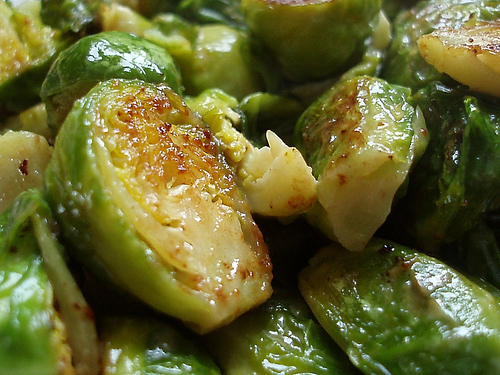 Pour sauce over sprouts– feel free to add a bit of chopped parsley if you desire.